Will the little voice be silenced? For three years the young boy has begged to go back home to his parents and to the Community of the Twelve Tribes he was raised in. He was kept at the “children’s home” (orphanage) only because he held onto the hope that he could go home at the end of the protracted court proceedings. Above all, he wanted to return to his parents. He believes also that it will work out well. As he has been at the home for a long time. The child offered various reasons why it would be better for him to be with his parents. He misses his parents. There were more festivals in the Community of Faith and better food. He could play outside and climb trees. Perhaps he will even meet his friend […] again. When asked what would change for him, if he were with his parents again, the boy enumerated exclusively (from his viewpoint) positive changes. He could help again in the garden and drive with his father on the tractor. He could join in with the festivals and fry potatoes in the fire in the Feast of Tabernacles. But the Bavarian authorities persistently try to break the will of the eleven-year-old child. The boy is not heard nor respected by the judges or the youth office workers. For three years he has only been allowed to see his parents under strict supervision once every three weeks for two hours each time, without any privacy. It is said to protect him from the influence of his parents. Once a week he can make phone calls, but never without being listened in on. Once he laid his head on the table and hid his face with his arms, sobbing and telling me how much he misses his parents. Talking of how he was dealing with the pain of separation and his longing to be with his parents, he said he tried to distract himself with computers and television programs. Moreover, some of the boy’s remarks indicate that he understands his institutionalization as a punishment, and he concludes from its increasing duration that the end of his time in institutional care is drawing near. Last summer he was transferred to another institution, and the Higher Regional Court (OLG) ruled that the removal of the parents right to care for their child remained. The painful separation from his parents and sisters was increasingly expressed in frustration and anger by the troubled boy, so he was to be placed for psychological treatment in January of 2017 in a closed section of the Josefinum. There his despair will be “treated” with drugs to “calm” him. Shall his small human voice be silenced in this way? The only way out was for the boy to run away! Now he has finally managed to flee, just like some of his older friends before him fled, and he has now arrived safely with his family. He never expects to be separated from them again. But will he succeed? According to the Jugendamt a major manhunt has been launched against him. . .twice already he has been torn by force by the police from his family. How much cruelty does he have to endure? Besides, there is still no court order that would allow the violent separation of him from his family and and placement in psychiatric care.” That means that even if the police could find him, they could not take him against his will from his parents, but merely inform the Jugendamt (Youth Office) of his whereabouts, and that he is well. In order to again separate the boy from his parents, a court must order the use of force against the boy himself. In the past, the Youth Office has not complied with this. In response to the post, “Will the Little Voice be Silenced?” a reader on our German site posted the following. “Only recently, a family from the Rosenheim district with five children returned to Russia (escaped) in order to escape what happened to these “Twelve Tribes”. Another family, customers of us, Germans, have emigrated to Denmark, with eight children, for the same reason. “It is real sad how dangerous the German state is for families. A comment “from the heart” posted long ago on our German blog. “I don’t know how it came about that the news ad, “Children Rescued from Beating Cult,” or something to that effect, caught my attention at a deeper level… and that I took another look and did some research. The suggestions and manipulation of the mass media have had too much of an effect on me. Since you all have underscored many things with quotes from the Bible, I’d like to do the same, “… and a big mouth was given her…” (oops, don’t know where that is right now). In brief, I’m deeply shaken, affected, and I cry about your fate. I assure you of my deep sympathy and prayer. You dear mothers, cry on His chest; that truly is a good place to cry…and you good fathers also, cry on His chest and put your arms around your wives. I pray for you all and place your children under His protection. We have to hold onto hope, even though it is not easy! On August 24, 2015, the parents published this card from their daughter, Chaninah, written in October, 2013. How true her words, the words of an innocent child who loved her loving parents, still ring. This heart of Chaninah’s could not be denied, and so custody was returned completely to her parents in early August, 2015. How are you doing! I am doing ok. Thank you for the letters. Thank you very much for the package and all that was in it. The scarf, the tea (we drank it right away), the honey waffles, the wool and the card. We are the two sheep! I was very happy. Many greetings to Ishah Chadasha, I think she also helped with it. I am so happy that we can see each other again in a few days. I can hardly wait. I hope our Father will soon bring us home again. Now we still have to wait a little while. We have to hold on to the hope, even though it is not easy! Many greetings to everybody!!! I miss you all very, very much! I love you and appreciate you!! Abba and Ima (or Imma) are how our children refer to their father (abba or source) and their mother (imma or foundation). Abuse in Foster Care, Corruption, Food for Thought, forcibly taken, have we not learned from the past? Under the guise of protecting the society, in the 15th century a modern trend set in – the persecution of witches. but had to be forced to make confession, in case of need, through embarrassing interrogation (along with torture), if there was great certainty concerning the guilt. The confession of the accused was counted as the most reliable way to find out the truth. A confession made under torture was only valid if it was repeated by free will, in written form after the torture. This seemingly humane regulation didn’t help the accused at all, but rather was threatened again, with further torture, if he’d renounce the confession he made under torture. 1. the introduction and application of the Roman law, that required a confession for the official final condemnation – be it through torture. of parents that don’t conform to the mainstream, but think and believe differently; among others, Christian home schoolers. In many states it leads to abduction of children and extensive persecutions of people of different faith. The intervention of the authorities make for further hysteria and a wave of persecution against people that think differently. The “pluralistic society” feels threatened by “parallel societies”. Added to the general phenomenon is the special juristic, political, and personal constellation in Nördlingen. 1. The introduction and application of the recently passed paragraph § BGB “the right of a child for nonviolent education” is used to separate children from their parents. Though officially evidence for endangerment of the child is required. people who thought differently and acted differently, had to be punished. 3. According to their inner conviction, the council members and Judges Doctor Sebastian Röttinger and Doctor Wolfgang Graf, as well as the mayor Johannes Pferinger, were protectors and advocates of the medieval world order. They were in duty from 1589 until 1598 and supported the witch trials. In the overall view the Carolina contains rather mild terms for the criminal offense of witchcraft, which can hardly be made responsible for the extension of the witch trials. But in Nördlingen, as in many other Reich-German sovereignties, witchcraft was not considered a common crime, but a crimen exeptum (exceptional crime). This evaluation allowed them to disregard the milder terms of the Carolina and to promote any form of excessive form of witch persecution; urgent legal procedures and unrestricted and repeated torture were the order of the day. Beyond that the main focus shifted from the accusation of magic curse to the accusation of a pact with the devil. One important element of the history of the Nördlingen trials is also the fact, that in the free Protestant imperial city the whole council was in charge of jurisdiction. people that think differently and act differently have to be punished and does not allow the Twelve Tribes to sell their agricultural products on the Nördlingen markets. 3. The responsible judges, prosecuting attorneys as well as politicians seem to have an inner conviction of being protectors and advocates of the modern ideology, it remains to be hoped that they won’t be carried away by the “sect persecution”. 42 children of the Twelve Tribes near Nördlingen are ripped out of their families in September 2013, because the parents are charged with abuse. The district courts of Nördlingen and Ansbach collectively withdraw the custody of 17 families in an urgent legal procedure based on the accusation of child abuse. The Jugendamt doesn’t know most of the families and is not interested in the individual evidences of the individual children. The Bavarian state parliament all agreed on October 23rd 2014 that the Twelve Tribes must be a dangerous sect. Can this discrimination be a reason to disregard a fair trial and milder measures, to promote the persecution of sects? The lawyers, staff of institutions, and foster parents realize that these families are being treated differently and that an approach as this one had not occurred before. Since it was about something so dangerous as witches, the council felt justified to break the existing laws. 43 people were charged with witchcraft in the imperial city of Nördlingen during the years 1589 until 1598. It was impossible to prove oneself innocent during the torture. The torture was repeated up to four times and for crimes of particular severity the torture was applied with extreme length, hardness, and frequency. A woman who was arrested because of witchcraft had to be guilty, whether the charge or investigation it was just or unjust. Or else it would be embarrassing for the responsible ones. Beyond that the main focus shifted from the accusation of child abuse to the accusation of “sect membership”. for she had been accused for witchcraft. Probably she had been denounced like many others. At first Maria, who was not aware of any guilt, hoped that the situation would quickly clear up through her good relationship with the mayor and as other members of the town council. all the children captive, because their parents are accused of abuse. The children are taken into custody based on false witnesses of ex-members whose purpose is to destroy the community. At first the parents, who are not aware of any guilt, hope that the situation will quickly clear up through the obvious good fruit in their children and their good relationships with the authorities for many years. the examination was recessed and Maria was brought back into the dungeon. Now she was first exposed to an embarrassing interrogation, in which she was supposed to admit that she had engaged with the devil. Maria Holl looked at the Mayor and the other men unbelieving because all of them knew her and were regulars in her restaurant. She was polite initially but eventually she denied the charges indignantly. Obviously now the protestations of innocence were given less credibility than the denunciations. The Mayor accused her of not taking the court serious and let her be brought into the dungeon so that she could reconsider her situation. of the nursing mothers is told that “She’ll never have her children back”. Thereupon the prosecuting attorney induces that all the youth of the Twelve Tribes are interrogated for the purpose of investigation. One of the youth taken captive comes home from school on November 17th 2013, and is interrogated before lunch. In this three hour long interrogation the detective chief commissioner tries to move the fourteen-year-old to make a false statement against her mother. All the other youth refuse to make any statements. The next thing decided is to hear all of the children at the family court in order to finally get the missing evidence for the charges of abuse. 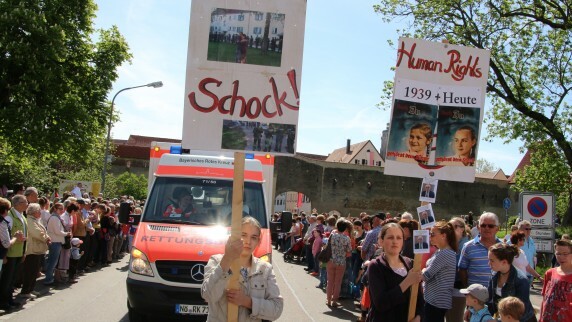 The effected families get the impression that the district court of Nördlingen is only trying to move them to confess their sect membership and the abuse they are accused of. Children and parents are desperately trying to convey the truth to the seemingly biased court. Head of the Jugendamt, school-psychologist, teachers and also the doctors were present in the community and could have testified that the children were doing good despite chastisement. Why were they not asked in order to find the out truth? Seemingly now the representatives of authority and protestations of innocence of the accused are believed less than the false statements of the ex-members. In the dungeon she had to endure by sitting on the floor with her arms and legs stretched far forward. It was only bearable when unconsciousness came over her. On the next day she again was brought into the interrogation room under unimaginable pain. Now it was about getting the supposed witch to make confession. With all the instruments of torture available the executioner went to work. Soon she realized that she was not spared from the torture by making little concessions. On the contrary: the councilmen blackmailed her all the more. Maria Holl revoked everything she had said before and was no longer willing to make any more confessions. The constitutional requirements for withdrawal of the custody of the child actually looks like this: in order to justify the separation of child from the parents, the courts have to find evidence in the individual case, that the parental care has reached to such an extent, that the child is physically, spiritually, or mentally endangered with its parents. Unfortunately this regulation doesn’t really help the families, because it is not considered in their procedure. They try time and time again to make the children speak against their parents. and months past in which the woman was exposed to incomprehensible pain by day and by night. One time the mayor even presented a letter to her from her husband, in which he expressed how deeply disappointed he was about her unfaithful behavior. Maria however saw through it that the letter had been faked and unwaveringly protested her innocence. One day Maria was once again tortured through the rope: Her arms were bound to a rope which was attached to a wheel and pulled her up on it. The mayor and the rest that were present decided to take in an extended lunch in the meantime and left Maria hang on the rope for two hours. Some time she eventually had to break. The Nördlinger people started having doubts about the correctness of the action because of Maria Holl’s inflexibility and willpower, so all the more the responsible ones put forth everything to black mail a confession in order to justify themselves before the public. But neither thumbscrews nor Spanish boots nor thorn ladders would cause Maria Holl to admit the deeds she was being accused of. parents don’t love them because they don’t want to deny their believe in order to get their children back. Through this torture the children are supposed to make confession against their parents. At some point they will break. After a few months some of the children can no longer withstand the psycho-terror and start doubting their parents. But most of the children are still writing heartbreaking letters of request to the judge, their guardian at litem and to the Jugendamt employees, that they would let them go back to their parents. Several youth see their only hope in fleeing from the institutions or foster families. Two girls hope to find refuge with their grandmother in their home country – Switzerland. At first the Swiss police does not find a reason to take the girls from where they are staying when they find them, but because of the insistence of the German Jugendamt they are once again separated with police force not only from their parents but also from each other. willing to give order to continue the torture. Nevertheless Maria Holl was still not released. Only months did they again take care of the crown landlady. Even after 62 tortures Maria Holl did not render a confession and slowly the displeasure in the population grew about the action of the town councils. Finally the family of the accused from Ulm stood up for her and the court came under pressure to act. It was impossible to execute her without a confession, but it could not either be admitted that an innocent person had been tortured for many months. In the meantime more advocates that were impressed by her perseverance had registered. Elected representatives were commissioned to direct a writing to the city of Nördlingen with the request to release Maria Holl. Her release was further delayed because they feared for the consequences and the relationships to the imperial city of Ulm. So as not to effect the reputation of the council, they presented her with a composed legal opinion, an oath of truce to sign. She obligated herself therein that she would not leave her house anymore and would not take revenge on her persecutors. In particular she confirmed the correctness of the actions of the city council. pressure can make the Twelve Tribes children admit the abuse they are accused of. After a while two families distance themselves from the Twelve Tribes and agree with the Jugendamt so that they can get their children back. So as not to damage the reputation of the judges and officials an agreement is made in court. The parents leave the rights for their children to the Jugendamt, this way they cannot leave the country anymore and pay the youth welfare measure. By doing so they confirm the correctness of the actions of the councils. Maria Holl signed and was able to go back to her life as a free citizen after almost two years. After this no other woman in Nördlingen was judged because of witchcraft. This early end of the persecution is due to the unfavorable process against Maria Holl which after multiple tortures did not admit and therefore had to be released. Unfortunately Maria Holl was misused in the third Reich for the advantage of national socialist propaganda. The witch was made into an Aryan hero who successfully fought against the slander of the “evil Jews and Gypsies” by her steadfastness. At that time the masses did not realize that the national socialistic leaders committed the same perversion of justice in the persecution of the Jews as the councilmen in the time of Maria Holl. Even today the wooden well on the “Winemarkt” in Nördlingen reminds of the steadfastness of Maria Holl and admonishes all the authorities to never again repeat an injustice as this. Her legacy to our time is that we would never forget what can happen if authorities blame citizens on the basis of prejudice and accusations. This way the court loses its function of protection and only serves to convict and not to establish the truth. The End Of The Persecution? After almost two years of the delay of the urgent proceeding it is time to acquit the children that are being held separated from their parents against their will, illegally, and without the proof of the endangerment of the child’s well-fair. We hope that this failed process against the courageous parents and children of the Twelve Tribes with their steadfastness will ensure that the persecution against sects and the rapid increase of seizures will come to an end in Germany. Only if the authorities actually learn from the past and do not disregard human rights can the well memorial of Maria Holl serve it’s true purpose. The term “People” generally means a community or a big group of people with the same culture. A common history, traditions, customs, clothe, folk music and dance and also education of children are a part of the culture of a people. We are disciples of Jesus Christ, the son of God. We are so thankful that we found forgiveness for our sins through his precious blood that we only want to live for Him. This is how we became God’s “peculiar” people – a people that belongs to Him, His possession, the people of His possession, that has always consisted of Twelve Tribes. When we talk about the Twelve Tribes, than we mean a real alliance of communities were people daily live together in unity. Twelve different Tribes are going to be a light to the nations in Twelve regions of the earth. It was no secret to the apostle Paul that god wanted to raise up his Twelve Tribe people, an Israel of the new covenant, were the Jews and the gentiles would be united through the Holy Spirit. Then is it so absurd that God wants to do the same in our days?